The Port of Felixstowe has taken delivery of its first two remote control ship-to-shore gantry cranes, the port’s press service informs. The new cranes were delivered on the Zhen Hua 23 from ZPMC in Shanghai. The new STSs are capable of working vessels with containers stowed 11-high and 24-wide on deck. Instead of being in a cab 50m above the quay, the drivers will be located in a nearby operations centre. Hong Kong-based Hutchison Ports, the owner and operator of the Felixstowe port, has already introduced similar remote control quay cranes at its other terminals. Based on that prior experience, Clemence Cheng said: “Their introduction at Felixstowe will improve the working conditions of the drivers, enhance safety and benefit communications within operational teams”. Besides, the port’s investment programme includes creating an additional 18,000 TEU of container storage capacity, upgrading its terminal operating system, raising the height of 10 STS cranes on Trinity Terminal and an order of 8 additional yard cranes for delivery in early 2019. 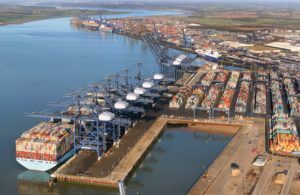 The Port of Felixstowe is strategically located on the UK’s southeast coast and can be easily reached from major ports in North West continental Europe. It is the UK’s first purpose-built container facility and today is the country’s largest container port handling over 4 mln TEU annually. With three rail terminals, it also has the busiest and biggest intermodal rail freight facility in the UK. The port’s most recent expansion project, berths 8 and 9, when fully completed, will provide additional 1,285 metres of quay with a draft of 18m to allow the docking and processing of multiple world’s largest container ships.